In 1 1/2-quart saucepan, heat water and sugar over medium heat about 2 minutes or until sugar is dissolved. Cool completely, about 30 minutes. 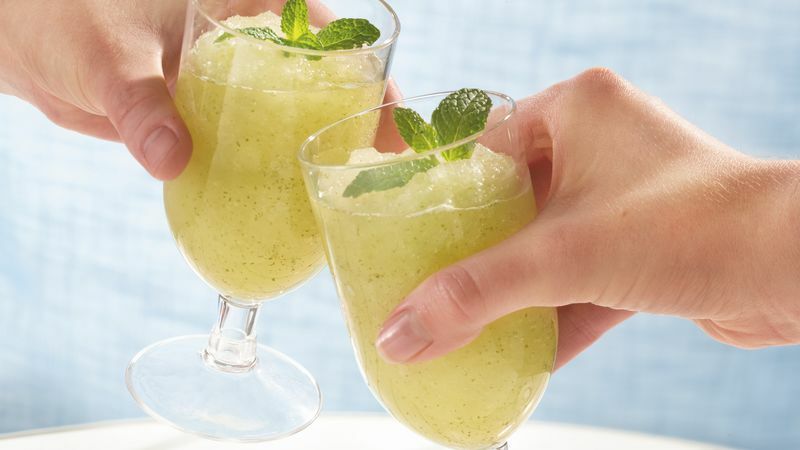 In 8-cup blender, place sugar water, lime juice, rum and mint leaves (if smaller blender, do in batches). Cover; blend on high speed about 20 seconds or until mint is finely chopped. Pour mixture into 13x9-inch (3-quart) glass baking dish. Freeze 4 to 6 hours, using fork to break apart ice crystals every 2 hours. To serve, spoon 1/2 cup mixture into each glass; pour 1/4 cup ginger ale over each. Stir. If desired, garnish with mint sprigs. Although there are many varieties of mint, peppermint is most commonly used for mojitos. Omit the ginger ale and serve this traditional Cuban cocktail as a granita.